This is the one museum to go to for a look into Turkey’s ancient past, and perhaps the best and most interesting museum in the entire country. 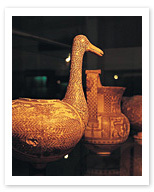 A stunning range of artifacts, sculptures, and works of art are arranged chronologically starting with the earliest known humans who inhabited Turkey during the Stone Age. The displays are remarkable in scope and quality, with informative descriptions and marvellous displays from the varied and numerous civilizations that inhabited this important land, with especially notable exhibits of Hittite figures and mythological scenes. The building, a restored Ottoman market and warehouse surrounded by immaculate gardens, is wonderful in itself, adding to the effect and making this the museum not to pass over if you have any time to spend in Ankara.